I was worried that it wouldn't be up to the hype...I worried for absolutely nothing! It was AMAZING and FUN and EXCITING and the most wonderful feeling watching and hearing Zoey and her friends giggling and squealing with delight and wonder for pretty much 48 hours straight. 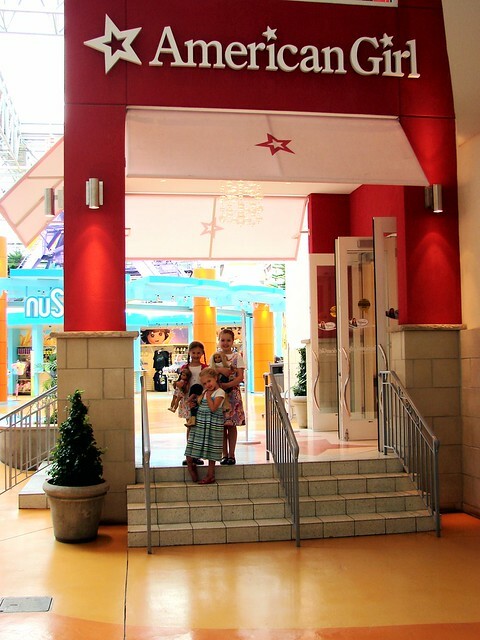 Visiting The American Girl store for the first time was just magical and everything that a little girl could dream of and more! My friend, and the mother of one of Zoey's best friends asked awhile back if we would like to make the trip to Minneapolis with them to visit The American Girl Place and we of course said yes...I am so glad that we made this little outing happen. It was such a special thing to do as mothers and daughters. It's something that I know that Zoey will not forget. The little jester styled skirt that Zoey and her doll wore on the first day were birthday gifts made for her from one of my friends and her daughter. My friend Misty made them out of old t-shirt scraps. It was fun because when we were in The American Girl Place pretty much every employee at some point came up to her and asked about her skirt and ooohed and ahhhed about it. Here is a little slideshow that I made up and put to one of Zoey's favorite songs of our visit. 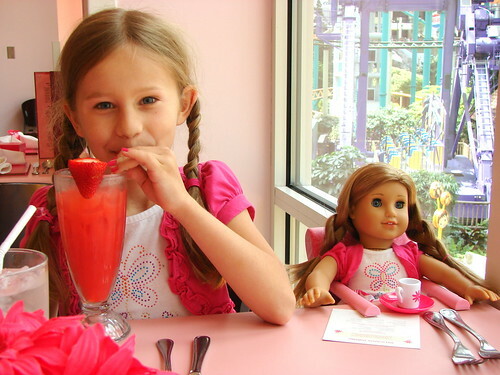 We ate at The American Girl Bistro for dinner on the day we arrived and then again for brunch the next day. The food was delicious and was presented in fun little displays for the girls. I will say though that they provided A LOT of food. Zoey wasn't able to finish either meal in it's entirety. 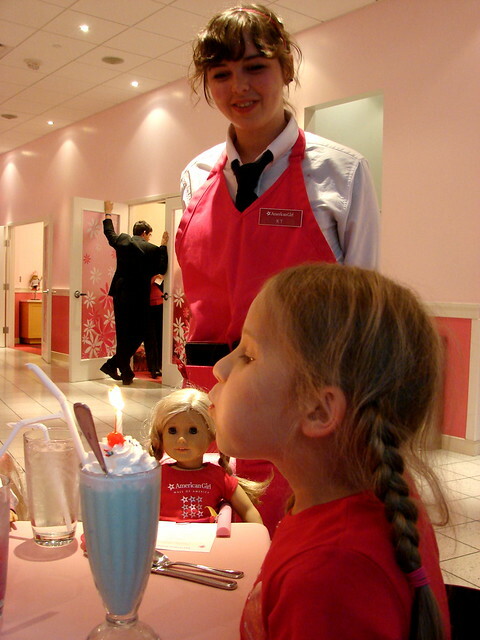 The experience totally made the trip though...getting to eat out with your doll at a fancy restaurant was pretty special and the waitstaff made sure to make it even more so. The dolls had menus (that the girls got to take home), and they had special chairs that sat up to the table and had table settings as well. of the Just Like You dolls, McKenna items and exclusives. It was fun to see all the employees interacting with the girls and not necessarily the mothers. 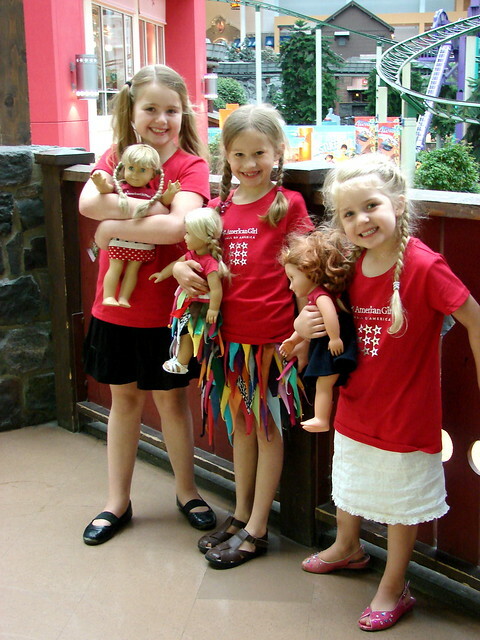 It was so fun for the girls to bring their dolls into the store and to get to just play while there. We had some fun exploring The Mall of America too...I hadn't been there since probably when I was in high school so it was fun for me to check it out again now as an adult. Zoey's friend and sister both got their ears pierced while we were at the mall and while Zoey was interested, she decided to not go ahead and get hers pierced yet. 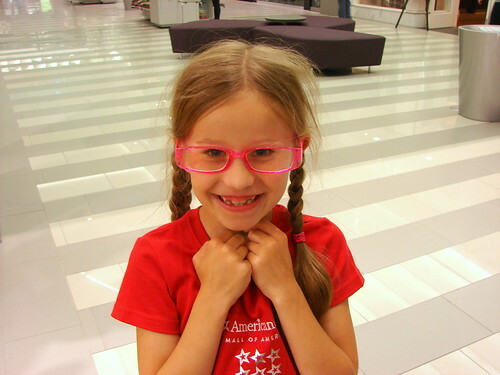 :) So instead she got some funny pink (non-prescription) glasses, pink of course. 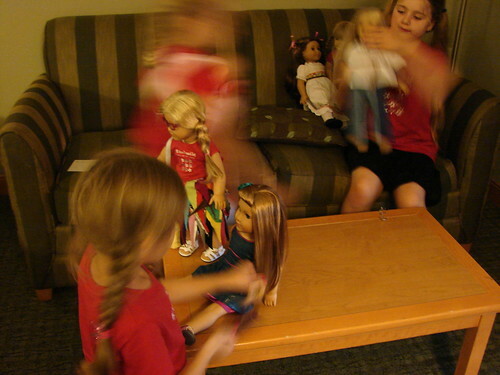 After our first day at The American Girl Place the girls came back to play with their dolls at the hotel. I think they went to sleep around 11:30pm that evening. It was so fun listening to their excitement and chatter before finally collapsing in bed. We had so much fun, and I have a feeling that we will be thinking about this trip for some time to come. 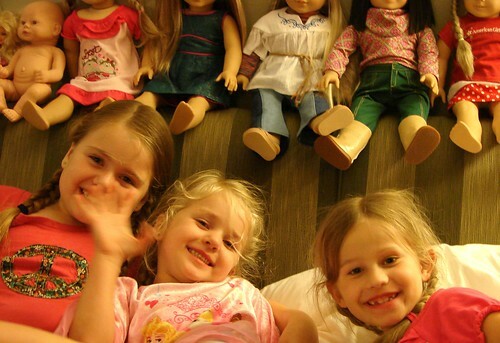 It's totally worth making the trip if you have a daughter (or granddaughter that loves dolls!). Thank you Amanda and Gracie for inviting us along! Aw, This looks like fun! I went to AGP Washington DC in July 2013! We almost went to NYC for my birthday but something came up. I am going to Columbus for my friends birthday though! I have gone to the AG store Seattle 4 times. 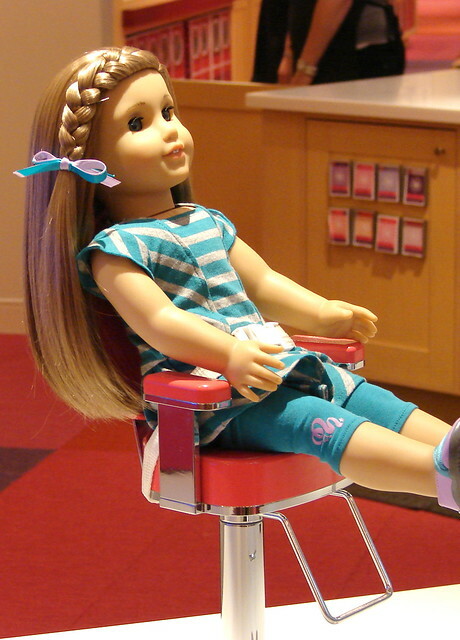 My first time was in 2011, when i got my first doll. 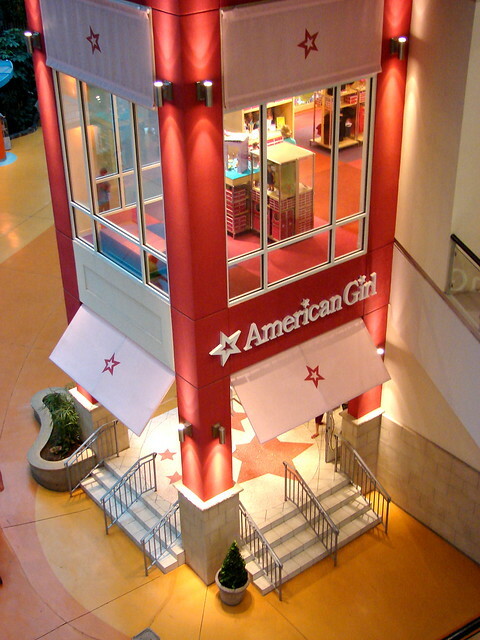 You got some amazing pictures at the American Girl Place! I haven't been there, but my mom has! i live in minnesota where that mall is and my daughter just got a backpack set!